An article by Esther Addley on theguardian.com - Mega lift? Stonehenge pillars were carried 230km over land - reports on new discoveries which cast doubt on the theory that Stonehenge's bluestones were transported by sea. Archaeologists say up to 80 two-ton blocks may have been dragged from Preseli hills in Pembrokeshire. Stonehenge: how did Neolithic builders, using only stone, wooden and bone tools, carve Stonehenge's bluestone pillars from the hilltops of western Wales? And how did they transport them more than 230km to Salisbury plain? The location of the two monolith quarries, according to the archaeologists, undermines the theory that the stones were taken to Wiltshire by sea. Instead the two-ton blocks, up to 80 in number, were dragged or carried over land. The archaeologists' research also supports the possibility that the bluestones - thought to date from the very first phase of construction at Stonehenge - may have first been used in a stone circle in Wales, before that monument was dismantled and transported hundreds of kilometres south-east, for reasons which remain a mystery. 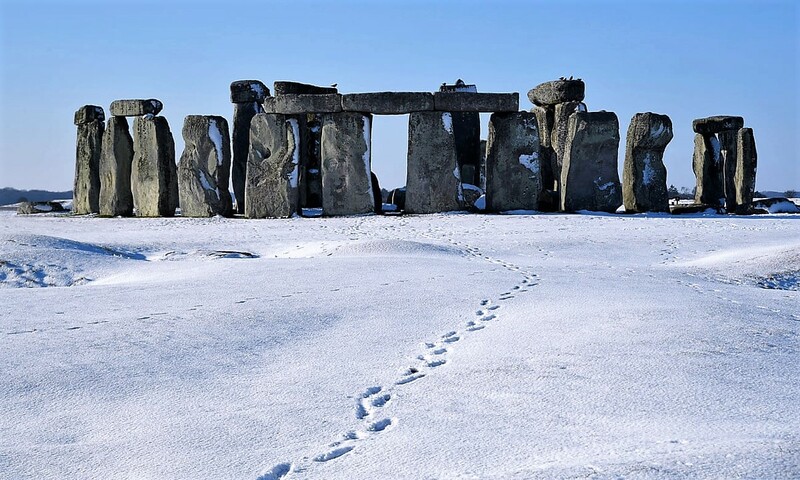 Prof Mike Parker Pearson of University College London, who led the excavation, is hoping to answer why Stonehenge's stones came from so far away. He explains that every other Neolithic monument in Europe was built of megaliths brought from no more than 10 miles away. Stonehenge's bluestones are not the enormous sarsen trilithons for which it is most famous, but a separate set of stones which now stand inside the sarsen ring but which, it is thought, may once have formed a much larger circle when the monument was first built, about 3,000BC. Though smaller than the sarsens - and often overlooked by visitors as a result - they are still about two metres in height and would each have weighed about the same as a car, according to Dr Rob Ixer, one of the report's co-authors. Excavation has also uncovered an artificial platform at the base of the outcrop, laid with stones. Prof Colin Richards suggests that the bluestone pillars could be eased down on to this platform, which acted as a loading bay for lowering them on to wooden sledges before dragging them away. A ditch dug next to the platform suggests the quarry may have been 'decommissioned' soon after the bluestones were removed, for reasons unknown. 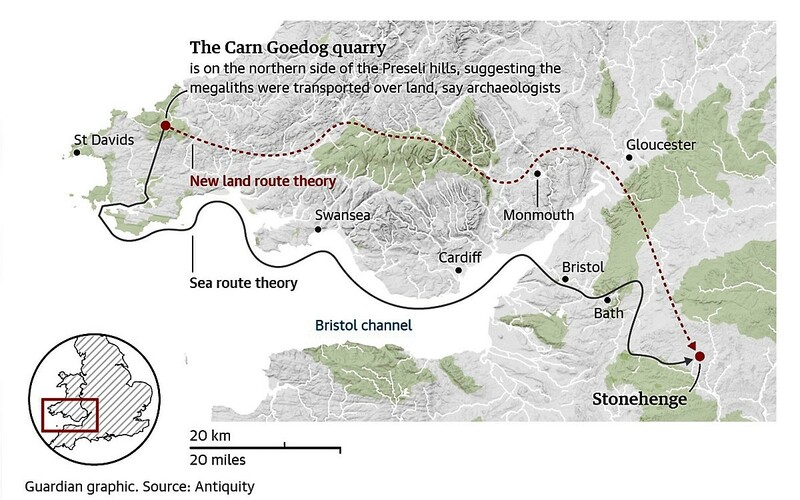 The bluestones were previously thought to originate from the southern Preseli hills, but Ixer explains that the location of Carn Goedog and the other confirmed quarry on the northern slopes of the range completely changes the assumptions of how the stones were transported to Wiltshire. Instead of being dragged down the southern slopes to Milford Haven, and then transported by raft along the Severn estuary and along the River Avon to Salisbury plain, he believes that the stones were all manually transported - roughly following the route of the modern A40.